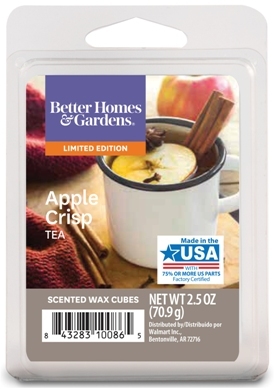 Apple Crisp Tea is a new Fall scent this year from Better Homes & Gardens and it was one I couldn’t wait to try. First sniff, I smelled a sweet apple with hints of something herbal. Good sign this scent would be a good one. We shall see! Apple Crisp Tea fragrance features crisp apple and black tea leaves create a warming and comforting sensation while a touch of cinnamon adds dimension. Sweet accords of fresh pear and apple blossoms infuse the heart and lead into a comforting base of amber, vanilla and sheer musk. Wow, sounds like one heck of a tea fragrance. Smelling the wax again, I could make out black tea leaves with a hint of pear. Apple – yes! Vanilla, amber and musk? Oh, I hope so!! Those elements sound amazing! I used the entire clamshell pack (3 cubes each) in two electric melters in my great room. Once melting, it took minutes before the fragrance was permeating through my living space, and this is going to sound crazy but the aroma smelled very floral to me. I kind of paused for a second and then sniffed close up to the melted wax just to be sure and without a doubt, I smelled rose petals. ROSE! My least favorite floral on the planet. I was so confused, I brought the dish with the melted wax up to my husband so he could give me his opinion and he agreed… rose all the way. Could that be the apple blossoms in the scent description? I’m thinking yes. What else could it be? Apple Crisp Tea was the most bizarre scent ever! After a full day of melting this scent, I’m going to say this fragrance smelled nothing like the scent description. The aroma in the air smelled nothing like apple, pear, vanilla, amber or musk. This was red rose watered down with a hint of spice in the background and even though it killed me, I stuck it out and melted this scent for a full day just to be sure. Now THAT is commitment candle lovers!! Strength – This scent was MEGA strong and pretty much saturated my entire house, upstairs and downstairs. Not kidding. It was so strong, you could almost taste the scent in your mouth. Strength – 20 out of 10 in any size room. For real. In the end… Apple Crisp Tea simply was not my cup of tea… at all. Pun intended. But, it was still an interesting aroma and one I recommend if you love rose fragrances or even floral scents. It was very different. So, next time you’re at your local Walmart store, go smell it. It doesn’t come off super floral’y when you first smell the wax but boy does that come out once melting. And if you end of trying it, I would love to know what you thought of it. 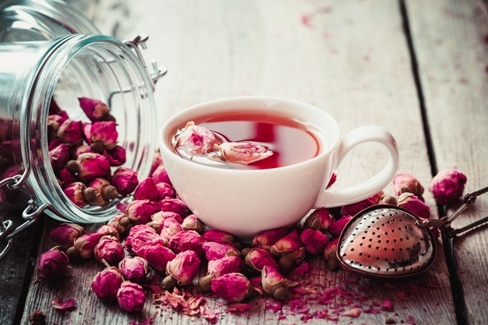 Apple Crisp Tea or rose water? My great room is huge. About 1600 square feet and completely open with 15 foot ceilings so I have an electric melter on each side. One in my kitchen, one in my living room. I’ve tried it all and 3 cubes each in a clamshell pack gives the best throw to fragrance that size room. Every scent is different though and I probably could have gotten away with 2 cubes each. You don’t know till you’re melting.